There’s a lot of furniture products out there designed with girls in mind. However, finding beds specifically designed for boys can be a considerably more difficult task. With that in mind, we’ve scoured the market for one of the best toddler beds for small boys. 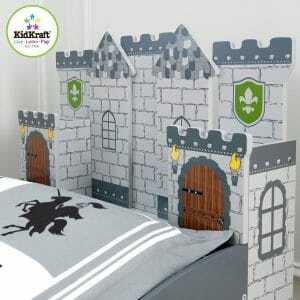 That product is the KidKraft Boy’s Medieval Castle Toddler Bed. 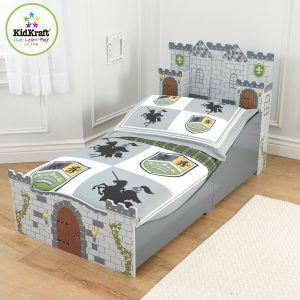 If this product looks like the perfect option for you, we’ve put together an ultimate review of this KidKraft castle toddler bed. It’s not all about this product though, we’ve also compared it with some of the alternative options to determine which one is best. Before buying this bed from KidKraft, it’s important to understand some of the most prominent features of the product. Obviously the biggest selling point of the bed is the fact that it features a medieval design. Both the top and bottom end of the bed utilise a fantastic design that would look in place in a medieval castle. Something else we love about the product is the fact that it also uses really great quality materials. KidKraft have used their signature wood MDF in order to create a bed that is sure to last you for many years to come. Because of these great quality materials, you’d fully expect the bed to cost you a fair amount, but that couldn’t be further from the case. This particular product comes in at just over $100. What’s more, you’ll be able to save a good deal more money on the mattress. This bed is compatible with most standard size crib mattresses, so you can either use the mattress from your old crib or purchase one cheaply and easily. It’s nice to see the fact that KidKraft aren’t pushing their own mattresses on you and making you spend more money. It’s worth keeping in mind that when you purchase this product, you will need to assemble it yourself. The product comes as a flat pack kit and includes all of the information you need to get the bed together and ready for your little one to sleep in. A: It’s 57.6 x 29 x 30.1 inches.It’s 50 pounds. Q: Where is this bed manufactured? Q: Does this bed have strong new furniture smell? A: MOST NEW KIDKRAFT FURNITURE DOES HAVE ODOR. Considering the above product is targeted at young boys, it might not necessarily be exactly what you’re looking for. Because of this, we’ve also taken a look at some alternative products that might be of particular use to you. 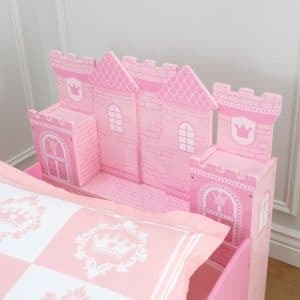 The KidKraft Princess Caste Toddler Bed is similar in nature to the boy’s bed, but is instead focused at girls. Despite largely being focused at young girls instead of boys, both products are actually pretty similar in terms of what they offer. The bed is made with top quality materials and sturdy construction quality. It is a little bit higher than most of KidKraft’s other products, meaning your little one might struggle to climb in and out of the bed easily. In all though, these two products are targeted at two different audiences. One is for young boys and the other is for young girls. Which one you choose is undeniably going to be down to the gender of your toddler. In general, you can’t go far wrong with this boy’s medieval castle toddler bed. It looks absolutely fantastic and features a design that just about any little boy will love. If you’re looking to buy a bed for a little girl, you’ll still find plenty to love in KidKraft’s range. When it comes to buying beds specifically built for children, KidKraft definitely have you covered.